Explore the horse-human connection by reconnecting with yourself – Sept 13-14 or Oct 18-19. Breath and balance between mind and body — these yogic principles can bring us closer to awareness of ourselves through our reflections in equine eyes. This is what we try to help participants achieve in our unique workshops blending the principles and practices of yoga and equine assisted learning. Horses live in the present completely integrated with their whole brain, all of their senses and their physicality. They are thoroughly connected with the natural world that surrounds them. Contrast this with what many people in the developed world experience in our day-to-day lives. In our work especially, we often are right-brain, visual, verbal and detached from our bodies and nature. We may be, as well, self-limiting in our perception of the world around us, and our place in it, as received through our senses. We may focus on using our vision and our hearing primarily, and our touch and taste to a lesser degree. We may be unaware of the messages given to us by our sense of smell. We may be fairly unconscious of some of the other senses we have that inform us about the world around us — proprioception and balance, for example, which tell us our about our bodies relative to the spaces around us. The meditative experiences and yoga poses we offer in our workshops begin to re-open awareness of all our senses, thereby broadening our experience of ourselves in our environment. This enhanced awareness deepens the potential connections to the sentient and sensitive horses encountered in activities facilitated for personal reflection. We do not merely think we know or try to rationalize about what the horse is telling us, we sense it in multiple ways, we feel it, we know it at a deep core level. Horses are expert at non-verbal communication and can read people in a glance. They absolutely know and trust their gut feelings coming from the non-verbal as perceived by multiple senses. People often ignore or distrust their gut feelings — their intuitions —even though 70 to 80 per cent of human to human communication, we are told, is non-verbal in nature. 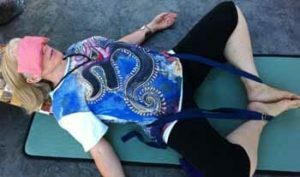 We encourage people to release themselves to the non-verbal through a yoga practice designed for all levels. Yoga can open a person’s whole being — heart, spirit, mind and body — to what a horse has to offer in honest and immediate feedback from them. 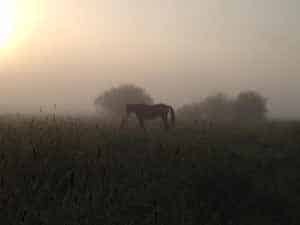 For instance, at the beginning of the retreat, during a guided meditation participants are asked to imagine walking up to a field and in the distance noticing the silhouette of what appears to be horses. They open the gate and make their way across the field. As they get closer, they are asked to make one simple request “Can I be part of your herd?” Participants are encouraged to pay attention to the answer. After the session, the group is then introduced to the Windhorse Retreat herd. Through an equine-assisted learning exercise, individuals are asked to choose their herd and then to share their insights with the group about their choice. Two-day “Discover you! Reflections in an equine eye” workshops at Windhorse Retreat (www.WindhorseRetreat.com) take place on Sept. 13-14 and Oct. 18-19. A weeklong retreat in Costa Rica runs from Dec. 4-11. No prior horse experience is needed for the workshops or the retreat. Please text, phone or email for more information or to register: 403-700-7880 or chinookcomm@gmail.com. As part of the natural aging process, the body produces smaller and smaller quantities of reproductive hormones. The ovaries and uterus shrink and ultimately the menstrual cycle ceases. Menopause is a gradual process that may extend over several years. Usually it occurs between 45-55 years of age, but may occur earlier. Other factors affecting the age of menopause is one’s general standard of nutrition, weight and whether or not one has had children. An early menopause can occur as a result of disease or surgical removal of the ovaries. Hysterectomy usually does not precipitate menopause unless both ovaries are removed. The decline of estrogen and progesterone triggers minor changes in the bones, skin and circulatory system but essentially all the menopause really signifies is that a woman can no longer achieve a child. Women may experience hot flashes, vaginal atrophy, weight gain, headaches, digestive upset, dizzy spells, palpitations, blood pressure irregularities, insomnia, lethargy, irritability and depression. They are not directly related to the fall in estrogen, but the stress of hormonal fluctuations do influence a woman’s mood and these difficulties could then be precipitated in more vulnerable women. For women who have been practicing yoga in earlier years often physical difficulties at menopause are less intense and any emotional disturbances practically non-existent. As with all hormonal imbalances, yoga asanas have a tremendous stabilizing effect. Some estrogen continues to be produced by the liver and kidneys even after the ovaries cease their secretions, and the correct yoga practices can stimulate these extra sources as partial compensation for loss of ovarian hormones. For those who have not been practicing yoga before, it is never too late to begin. Women who have undergone a hysterectomy or other major operations are equally able to commence. Workshop will include the practice of asana, learning pranayamas specific to menopause along with some suggested mantras and mudras. blanket under your head for comfort if desired. Relax here for up to 10 minutes. This pose is beneficial for irregular periods, heavy bleeding, insomnia, headaches, eye strain and fatigue. Savasana for Stand Up Paddle Board Yoga: Letting Go of Edges!!! Join Natasha for SUP Teacher Training Sept 13th! The gifts that teaching SUPYOGA have given me are far beyond anything I could have ever expected. The peace of the water. The freedom of having a lake all to yourself. The open-ness of asanas in a new way…..but the best gift of all is this: SUPYOGA has offered me laughter with people I barely know, it breaks down walls when given the chance to LET GO and FALL IN. Fall in to water, to freedom, to open-ness, to peace. It allows you to reclaim your sense of humor with yourself, all the while having moments of incredible strength and balance. After all the splashes, the toddler steps, the hugging to center, the riding of the waves ….we rest. We rest in SHAVASANA on our boards and take it all in. Eyes Closed. Let the arms and hands float in the water. Slowing down your breath. Watching the inhalations and exhalations….creating a softer and longer breath. Watch how your body responds to the waves of your breath. Take your awareness right up to the crown of your head for a body scan. Slowly move down thru your body checking in with how everything is feeling. Notice places where you feel evidence of your practice, warm fuzzy like sensations where prana is flowing like water. With your awareness at your feet soften you feet. Relax your feet. Relax your feet. Fully relax your legs. Let the legs feel heavy fully relax your legs. Let the knee caps feel like they are floating. Soften the lower back, let the lower back sink, creating spaciousness thru the lower back. Feel your breath at your lower lungs. 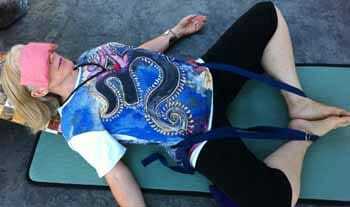 Feel the ribs expand on the inhalation and feel the breath come back to center back home on the exhalation. Soften your heart center. Soften thru the front side of the heart center, soften the back side of the heart center, in between those shoulder blades, the sides of your heart center…relax the heart center. Let the shoulder’s sink. Relax the shoulders, let the shoulders fully relax. Fully relax your arms, as you relax your arms let them float. Relax your arms. Soften your hands. Feel the water thru your fingers and fully relax your hands. Relax your neck. Soften thru the front side thru your throat. Soften the back side of your neck, and soften the sides of your neck…fully relax your neck. Soften your jaw, relax your jaw, relax the jaw. Let the tongue sink right down to the bottom of your mouth. Relax your tongue. Relax the tongue. Let there be a natural space between your teeth and your lips. The space between your eyebrows; make it even bigger. Relax the eyes, let the eyes feel soft and light, relax the eyes. Soften your forehead, creating spaciousness thru your forehead, relax your forehead. Let the entire face feel soft and light. Relax your scalp. Soften the scalp. Let the ears feel like they are sinking. Staying right here just above sleep…. fully enjoy all the sensations outside of you…the sun, the warm breeze, the water….and then fully enjoy all the sensations inside of you….the lightness, the warmth …..
A few minutes of silence. https://soyayoga.com/wp-content/uploads/2014/09/SUP-savasana.jpg 188 350 Robert McConnell https://soyayoga.com/wp-content/uploads/2013/08/20-logo-training-excellence.png Robert McConnell2014-09-04 11:33:382014-09-04 13:47:16Savasana for Stand Up Paddle Board Yoga: Letting Go of Edges!! !